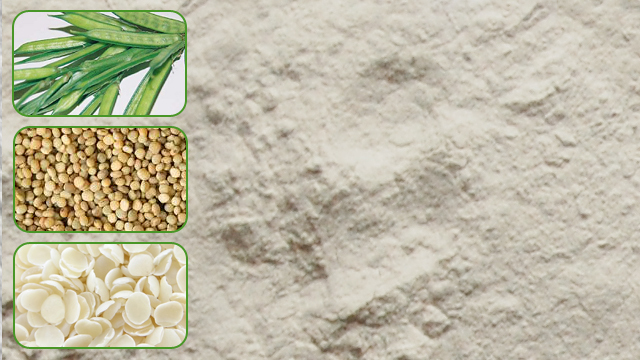 Guar seeds are processed and the endosperm is extracted to transform into gum powder, this product is termed as guar gum. It is also referred as guaran, guarkernmehl, goma guar, gomme guar, etc in different languages. The seeds of this crop contain high low-shear viscosity when compared to other crops like locust bean and for this reason the extracted gum is applied as thickening and stabilizing agent in many applications. This product is found to be a cost effective alternative for thickening, stabilizing, binding, emulsifying and plasticizing applications also. The high galactose-mannose ration makes it stay affluent for multiple functions. It exhibits comparatively and considerably higher thickening function than conventional products like corn starch. It helps in preventing crystal formation when applied with ice. It grows even in places struck with draught. It produces into excellent gel when combined with water. As far as cultivation is concerned, Indian states contributes majority of share in growing this cluster bean type of crop. Some of the important locations where larger cultivation can be seen are Gujarat, Madhya Pradesh, Haryana, Rajasthan, etc. Farmers choose sandy soils in North West Indian sates to get better yield of seeds. The same practice is also found in Pakistan and some of the western regions in the globe. The gum powder works efficiently in reducing blood glucose and lipid level. This product is whitish or yellowish in color and carries a mild odor. The extracted endosperm is then sent for processing wherein they are transformed into dust particles. The yield can be calculated in terms of subtracting the weight of bean pods from the actual weight of beans. Say for example, if 100 kilograms of beans are processed the yield in powder form would be 29 kilos which is then calculated from the actual mass of endosperm. India is the key producer of this crop which is then followed by Pakistan and US. These three nations comprise about 80% of the overall production across the world. Semi arid and sub tropical areas suits best for growing these crops and they can be preferably grown during the months of October and November. The seed is a mixture of germ and husk in addition to endosperm therefore these components are also applied in different applications other than the usual range. The seeds are sown instantly after the first showers during the monsoon onset. Apart from the usage on broad spectrum, this plant bean is considered a nutritious vegetable. The hay is also found to make a good fodder when mixed with wheat. Extraction of seeds into powder form depends on the selection of processing methods. Our manufacturing sector is equipped with technically advanced equipments to carry our processing and to obtain higher grade gum powder. In addition, we also adopt contemporary methodologies to guar gum manufacturer for growing market demand. The Microbiological Quality Test consist of bacteriological test of the Food Grade products like Standard Plate Count, Yeast & Mould, Salmonella, E-coli, Colliform, Pseudomonas, Staphylococcus etc.